Texting My Pancreas: Insulin Pumps In The Wild. You know that moment where your diabetes-related spidey sense kicks in, and you can't help but stumble all over yourself? It could be triggered by a familiar-sounding "beep-boop-beep!" from outside of your personal bubble, a glimpse of pump tubing flapping in the breeze, or the accidental eavesdropping of a conversation not aimed at you. 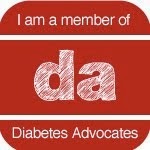 But sometimes, it's seeing a purple pancreas clipped to the pocket of a Target employee as you pass by. You don't want to be "that crazy lady", so you bite your tongue and keep walking. But then, minutes later, that pump and its owner are mere steps away again, and you can't help yourself. It's like word vomit. It has to come out. You motion to the silver pump tucked into your own pocket, as if performing some sort of secret handshake maneuver known only by those who have joined The Club No One Wants To Join. "Me too! I have a Ping." Your voice is tinged with a tad too much enthusiasm. "Yeah. Well, rock on." You realize that you had no road map for conversation past this point, and with the one word replies you've accumulated, you retreat. Cut to the checkout line, as the cashier rings up the last of your items: she's back. In your line. Standing right next to you. You debate. You know you should just shut up, pay for your multi-pack of dry erase markers, and walk out the door. But YOU JUST CAN'T. "So how do you do this? I mean, every time I'm here, I drop low from walking around so much. It's like you guys have inhalable insulin in here." She politely laughs, albeit uncomfortably. "Oh? Um, I don't know. It, uh... it doesn't really happen to me that much." You smile, say "Oh, okay", and get the heck out of there. Friend 1: "Geez, you always take forever!" 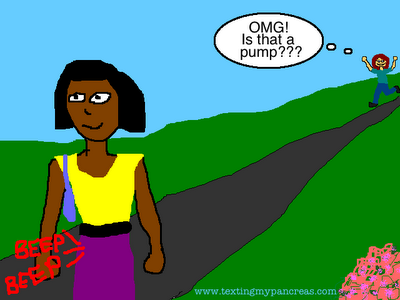 Friend 2: "It's the insulin pump! I have to hold it in one hand and then try to do everything else with the other." Been there, done that. And you're right about the awkwardness. I was in a store with my family, and encountered a family where a father and son both had pumps (the young boy had a fanny pack with tubing tangled all over the place). I struck up the conversation, then realized I had nothing to say. Do I give advice? offer condolences? 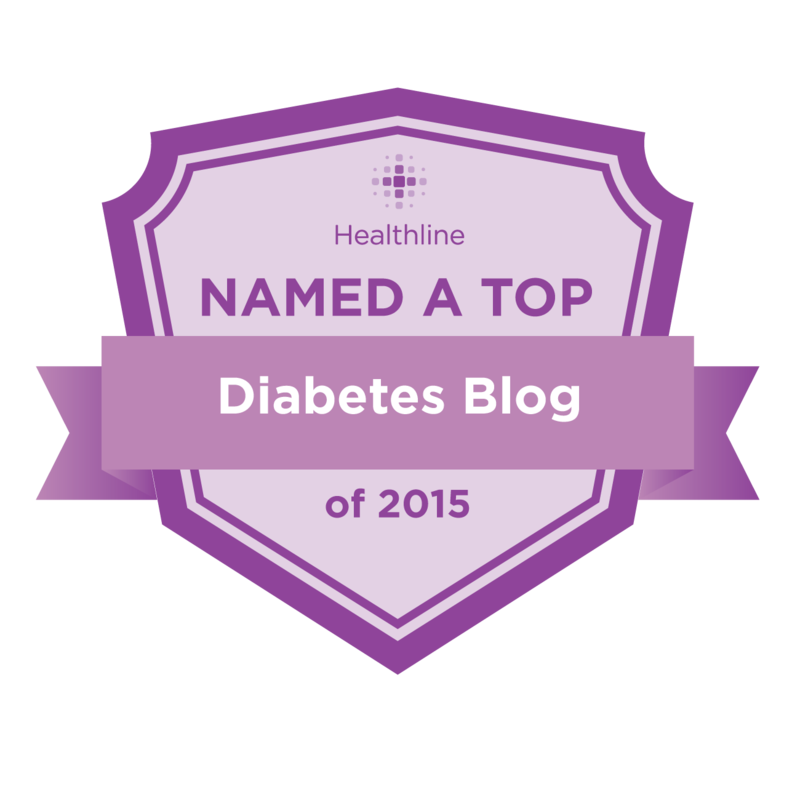 compare basal rates? Yeah, it's awkward. Well, then it could lead to "how long have you had D? ", to which they will probably ask you the same or not.. then you can whip out a hand-made DSMA card and invite them to the chat! :-D It's an easy way to end the convo and add more d-awesomeness to the DOC. Oh Kim, you read my mind. This same type of thing happened to me last week at a work conference. I kept mine quiet on silent, but the first day i kept hearing my pump sounds, yet couldn't find out where it was coming from. The second day i kept hearing it but during lunch when a peer found out about mine, she said someone else is getting messaged too on theirs that looks just like mine. I explained it's not a "message machine" and then as soon as i found that man, I pulled mine out like a crazy pants and he smiled, saying that he saw mine yesterday but didn't want to draw and unneeded attention. Long behold after our conversation he has his and his tubing hanging all out and proud! :) Love it!!! The last time I found a fellow pumper in the wild, it was in the ladies' room at an event I was attending. I was just about to exit my stall when I heard a familiar series of beeps. I asked the two girls at the sinks, "Okay, this is going to sound kind of ridiculous, but does one of you have an insulin pump?" The girl with the pump actually responded positively. We later found each other on a website we are both members of...it was only then that we found out we are both named Hannah. As that target employee (not the one you talked to, but one that it has happened to) I don't mind if anyone asks,, especially another pumper. I like having that secret awkward handshake! I feel in, even if it IS a club no one wants to be a part of. I was looking at shoes in Target a few months ago and a mom and her daughter walked by talking about the cost of insulin. I am awkward so of course I spoke up. We aren't going to be BFF but it was a fun conversation and I think I convinced them to start looking into pumping.